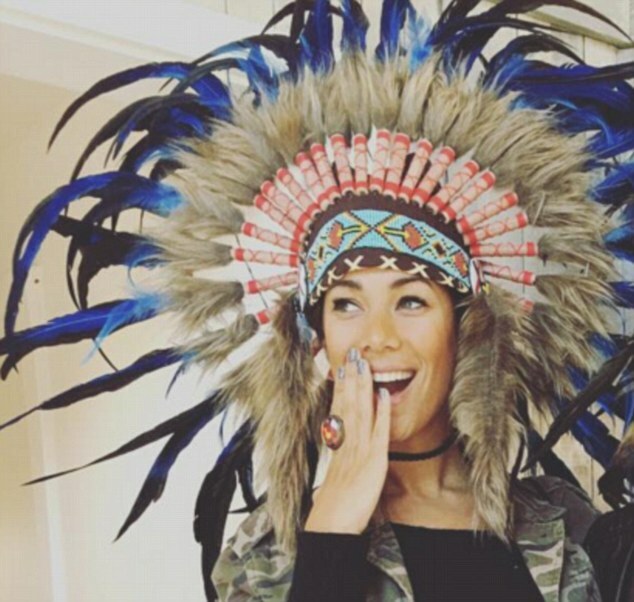 By Sam CreightonIt was meant as a fun picture, but this harmless image of pop star Leona Lewis wearing a Native American headdress still managed to upset some sensitive souls on social media. Within hours of sharing the pictures on Instagram yesterday, she was branded ‘ignorant’, ‘disrespectful’ and ‘racist’ for supposedly making light of the headgear’s cultural importance. One of her 380,000 followers wrote: ‘As a Native American I just lost so much respect for you. The headdress is reserved for our revered elders who, through their selflessness and leadership, have earned the right to wear one. It’s a spiritual garb, not just cultural.’Comment: Note that Lewis appears to be making a "woo-woo" gesture with her hand. Thus exacerbating the offense. Also note the "warpath" stereotype in the headline. And the insulting term "PC brigade." Protesting racism isn't politically correct; it's correct, period. For more on the subject, see Indian Costumes at Annual Turkey Trot and Jenner and Hilton in Stereotypical Costumes.